A plume of smoke, as seen from Stanley City Park, rises from the Trailhead Fire Wednesday afternoon. 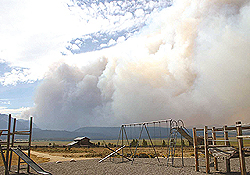 The fire re-ignited Tuesday and rapidly charged east through dry, beetle-killed pine toward Stanley and surrounding residential areas. Photo by Lynne Stone.